Mandelbrot Hutch — De JONG & Co.
With a traditional footprint and a contemporary, minimal aesthetic, the Mandelbrot Hutch is an impressive and stately piece that will stand proudly anywhere in the home. The Mandelbrot Hutch is the flagship casework piece in the Mandelbrot line and features the iconic bevels which conjoin in each corner to a distinctive, solitary point. The sharp, clean lines are soft to the touch as the bevels fall back into the piece. Every detail is scrutinized with care. The Mandelbrot Hutch features a custom open shelving layout sure to display your most important pieces with dignity. The casework, drawer boxes and shelves are constructed from solid, sustainably-sourced American hardwoods. The minimal brass pulls are made by hand in our downtown Los Angeles workshop by skilled craftsmen. The door and drawer fronts feature a custom finish that can be easily cleaned without compromising the depth of sheen. A durable, VOC-Compliant two-part Italian sealer similar in depth and durability to an automotive finish yet tailored for the home. 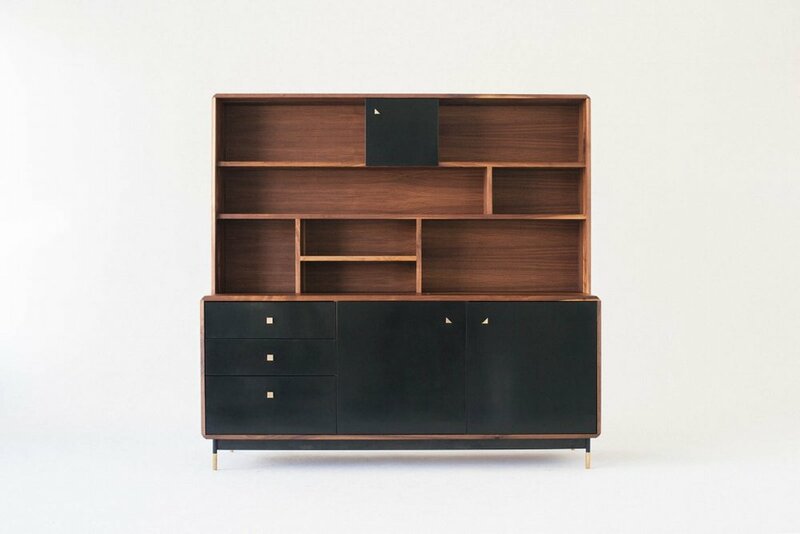 The Mandelbrot Hutch reflects a contemporary and minimal aesthetic. Look for the rest of the Mandelbrot line to help complete your interior. Pictured in walnut with a hand-rubbed oil and wax finish, black fronts, brass hardware, and a blackened steel base.